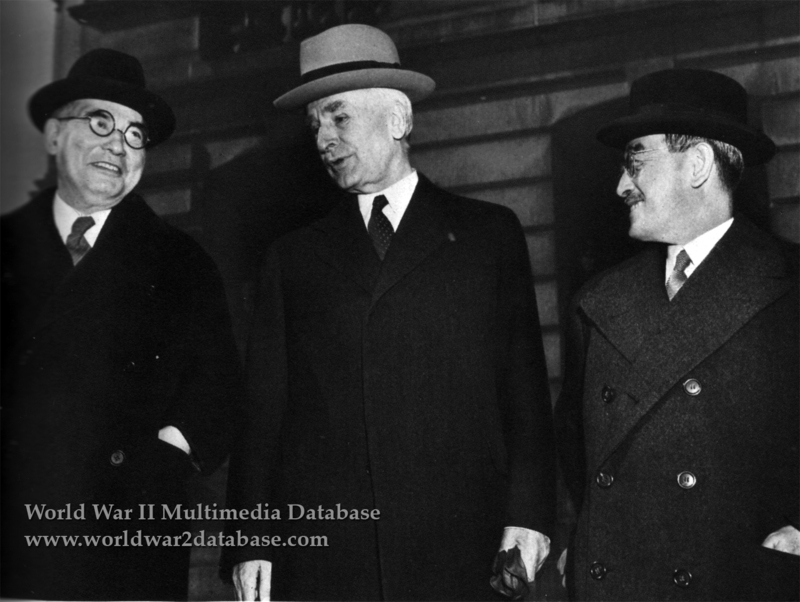 Imperial Japanese Navy Admiral and Ambassador to the United States Kichisaburo Nomura (December 16, 1877 - May 8, 1964), left, United States Secretary of State Cordell Hull (October 2, 1871–July 23, 1955), center, and Japanese Diplomatic "Special Envoy" Saburo Kurusu (March 6, 1886 - April 7, 1954), right, greet members of the press on the steps of the State, War, and Navy Building (today the Eisenhower Executive Office Building; commonly known as the Old Executive Office Building). The trio were on their way from Hull's Office in the State Department to visit United States President Franklin D. Roosevelt at the White House. "Special Envoy" Kurusu had just arrived from Japan. Believing Kurusu carried new information from the Japanese Government led by Prince Fumimaro Konoe (October 12, 1891 - December 14, 1945) Roosevelt and Hull were surprised to find that Kurusu "had brought no new materials, plans or proposals" according to the official history of the State Department published in July 1943. Kurusu did tell Hull and Roosevelt that the situation was a "powder keg" in Japan, and that both men hoped to resolve the situation peacefully. While the diplomats spoke, the Imperial Japanese Navy's plans for the attack on Pearl Harbor and other Allied territories moved forward. For the rest of their lives, both men claimed they were ignorant of the planned attacks. Both escaped prosecution at the Tokyo War Crimes Trials as a result.